Normally I would have posted a pre race the night before a race, but I was a little aggravated last night and didn’t want my aggravation to show itself in my post. However, now that everything is over, I will take a short moment to air out my grievances. 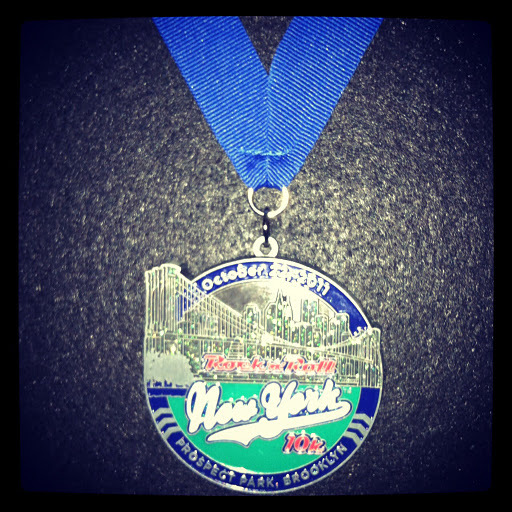 Yesterday was packet pick up for the Rock’n’Roll New York 10k in Manhattan. Pick up was originally scheduled to be from 12-5, which anyone who has a job would have had no chance of making. They then extended it to 7 which gave a little more hope to most people, but I still had a conflict. I work at a high school as a Teacher’s Assistant and supervise the JV soccer games. I was supposed to supervise a game yesterday afternoon, so I sent an email to the race company asking what I should do if I was unable to make the one packet pick up they had scheduled. I received an email back saying that I could pick up my race packet the morning of the race, but to please try and make the scheduled time in the city. My soccer supervision ended up getting moved to Thursday afternoon so I was able to make it to the pick up in Manhattan. We took the LIRR into Penn Station and walked up 7th Avenue to 49th street where the pick up location was. Here is where the grievance comes in. I get to the pick up location, and I get my bib number and head over to pick up my swag bag and race T-Shirt, and they tell me that they only have large shirts and do not have any bags left. I was told that I would have to pick to up my bag and shirt at the race site. This would not have been such a big deal if they didn’t make it seem like it was essential to make it to the pick up in the city. Long story short, I did get all my stuff after the race this morning, but that really got me aggravated last night. So, last night Amy and I had dinner at Olive Garden in Manhattan. I had the new-ish Stuffed Rigatoni with Sausage dinner. It was delicious!!! (I highly recommend it) Amy had Chicken and Shrimp Carbonara which also looked very good. 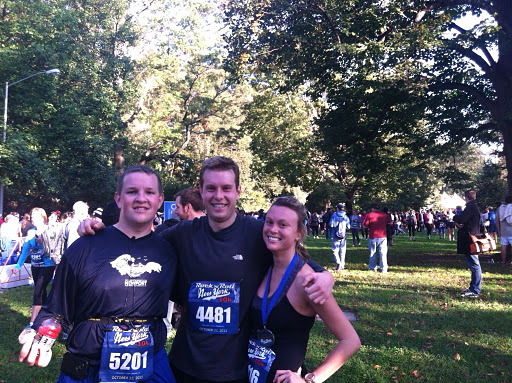 We woke up bright and early for the race this morning, and drove with my Dad to Prospect Park. It was a chilly morning, I had on my shorts and Newport half Tee to run in with sweat pants, running jacket and wool hat to keep warm before the race started. My Dad dropped Amy and me off at the park and he went to park the car (got a GREAT spot!). We tried desperately to get pictures of the sun rise, but there were too many trees in the park to get any good shots. As we made our way over to the start line, we ran into Amy’s Aunt who was doing this race as well. Small world! Amy’s cousin and his girlfriend also ran this race and a woman my mom works with. The race start was a corral start assigned by anticipated finish time. 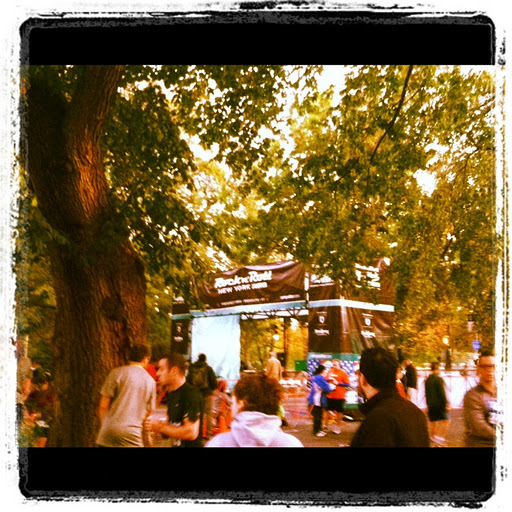 I started in the 1:05:00 pace corral, Corral 5. Corral 5! I am not pictured here. I grabbed a spot next to the fencing so I could talk to Amy until my corral started. I stretched the legs slowly peeled off the layers because it was still a little chilly. The race started and I felt great! I decided I was going to give this race my all. I had originally hoped I could finish under 1:05:00. I usually run a 10:46/mile pace in training so I knew I could finish just under 1:07:00 if I kept that pace, but I wanted more. I started the race feeling great, possibly better than I had ever felt before or during a race. I started out with 10 minute miles for miles 1 and 2, and then really picked it up for what i normally run. I did miles 3 and 4 under 9 minutes each and miles 5 and 6 under 10 minutes. Crazy!!! My final time was 59:29 with a pace of 9:35/mile. The park was beautiful and I really enjoyed the scenery! I really hope they choose to do this race again next year. 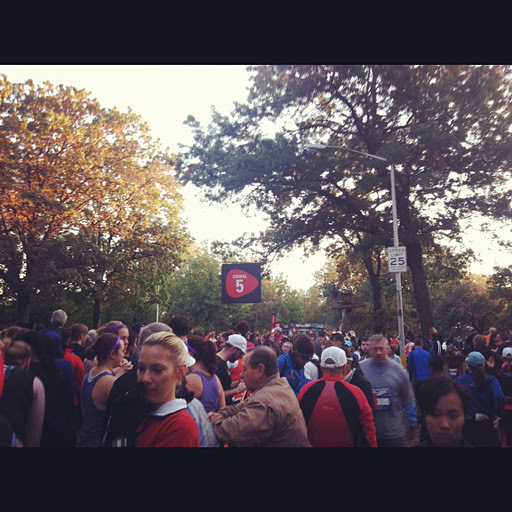 There was an awesome turnout for it being the first time they did it over 4200 runners!